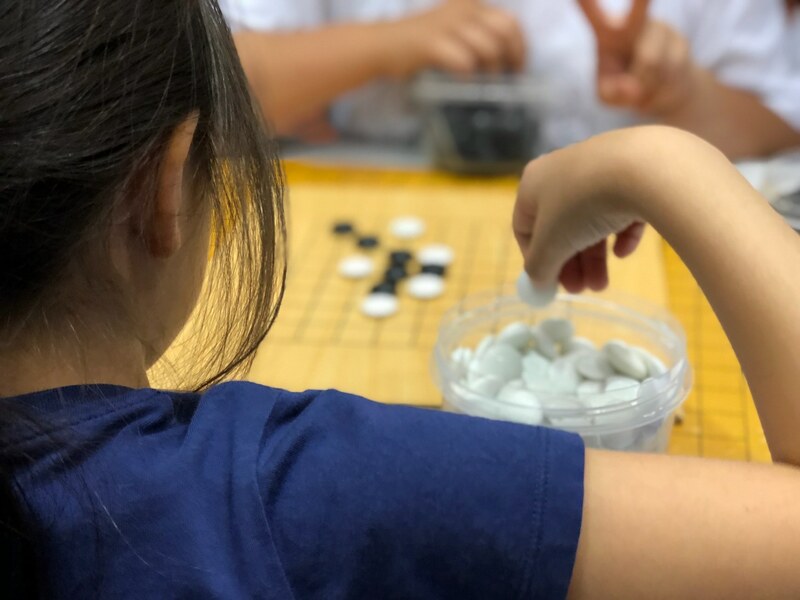 Unfortunately, we didn’t get enough students registering for Go Club this time; so as of December 9, 2018, this session is canceled, and all registrants should have received a refund. We’ll try again in the future! Mondays, 2:40 – 3:40 PM. Scholarship Registration: Nov. 7, 2018 – Nov. 13, 2018. General Registration: Dec. 2, 2018 – Dec. 8, 2018. No session on Dr. Martin Luther King Jr. Day, Jan. 21. No session on Presidents Day, Feb. 18 (week of mid-winter break). About 3000 years ago in China, the game called “Go” was invented. (In Chinese it’s called “Weiqi”, 围棋 / 圍棋. In Korean, it’s “Baduk”, 바둑. In America, mostly we first learned from Japanese, who call the game “Igo” or just “Go”, 囲碁.) Legend has it that Emperor Yao invented the game to help focus his son’s mind. We cannot say for sure it’s true; but we do know that, like Chess, playing Go trains people to think with rigorous logic, and helps develop social skills like sportsmanship. In addition, Go seems to use both hemispheres of the brain, and fosters development of spatial and pattern recognition abilities. Go is now played around the world, and made headlines in 2016 when, for the first time, AI software (called AlphaGo) beat a world-champion human Go player (Lee Sedol). JSIS Go Club will be led by experienced instructors from Seattle Go Center. Starting from scratch, and focused on learning by doing, we will encounter the fundamentals of “Capture” on smaller boards (7×7 and 9×9), and will gradually increase the level of challenge to fully-fledged Go on medium-size boards (11×11 and 13×13). Some individuals may progress to the full-size board (19×19) by the end. Children who already know how to play Go are welcome too, and will spend part of the time as peer role models, and part of the time on activities calibrated to their individual level.